Kirkby High School, Bracknell Ave, Kirkby, Liverpool L32 9PP. Track & field based fun sport athletic activities and games session for Junior athletes aged between 7-17 years old. Junior sessions are just £1 per session, as a contribution towards the cost of hire of the track. For all our sessions, the juniors have exclusive use of the track. 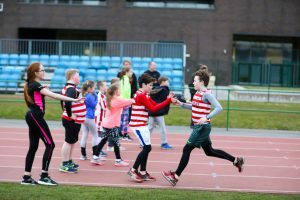 We focus mainly on running with relaxed, fun sessions and games, which are a fun way for children to get active, stay fit, have fun and grow in confidence. If you have have any question, please get in touch via our contact form here or just turn up to any of the junior sessions. Only thing required is a pair of trainees and whatever is comfortable to run in. KNOWSLEY HARRIERS AC are indebted to Merseyrail and DHL Parcels for their support of our junior training for 2017 and 2018.